Broccoli is a nutritious green vegetable belonging to the Cabbage family. It also bears resemblance to its relative, Cauliflower. The leaves, stalk and florets of Broccoli are all edible, but vary in flavor and texture. Broccoli is high in vitamins A, C and D, and goes well in a variety of dishes, including stir fries, raw salads and soup. It has also been shown to reduce the risk of cancer. Eat broccoli once or twice a week. A plant originally from southern Italy, broccoli can be green, white or purple. There are several other varieties, in particular the broccoflower, which is close to cauliflower, and the Romanesco broccoli, which is the result of a cross between broccoli and cauliflower. It has large (10 to 20 cm) green heads and thick stalks. TIME IT RIGHT. How long has the broccoli you choose been sitting in the produce section? You'll never know, unless you ask. So find the produce manager and ask when he puts the fresh broccoli out. It's well worth knowing and timing your visits accordingly. GO FOR THE PURPLE. Of course broccoli is green, and you want to choose broccoli that has a nice deep green color. But did you ever notice a grayish-purple color on the florets? That's your key to choosing a really flavorful broccoli. Trust me on this. You won't believe the difference until you compare "purple" broccoli with the ordinary kind. The nutritional value is the same, but the "purple" broccoli is so much tastier! CHECK FOR FRESHNESS. Color won't help if the broccoli you choose is rubbery, has wilted leaves, brown areas, or just looks bad. The broccoli you want is firm, deep green (or with purplish-gray crowns -- see Step 2 above), and chilled. Don't accept less-than-appetizing broccoli just because it's there. If you don't like what you see, ask the produce manager if he has a fresher selection. Choose broccoli with tight, compact crowns and firm, bright green stalks. Avoid broccoli with yellow florets or leaves. Check the end of the stalks to make sue they are moist and have no openings. Tight, closed, moist stalks indicate fresher, more tender broccoli. When buying broccoli, if there is bluish or purple coloring on the head florets this is a good sign tht it is denser in essential phytonutrients. Avoid buying broccoli with any yellow coloring on the florets or leaves, as it means the broccoli is overaged. Buying: You can buy Broccoli on your local and supermarkets. Procuring: Broccoli is a cool-weather crop that does poorly in hot summer weather. Broccoli grows best when exposed to an average daily temperature between 18 and 23 degree Celsius (64 and 73 °F). When the cluster of flowers, also referred to as a "head" of broccoli, appear in the center of the plant, the cluster is green. The cluster will appear exactly like the broccoli you eat every so often. You need to use garden pruners or sheers to cut the head about an inch from the tip, and be sure that you cultivate it before the flowers on the head bloom bright yellow. Cooked broccoli, still firm, may be served hot or cold. It is delicious dressed with a vinaigrette, covered with béchamel, Mornay or hollandaise sauce and gratinéed, with butter or puréed. It is served as a side dish or used in soups, stews, stir-fries, omelettes, souffés, quiches and pasta dishes. It works well in recipes for cauliflower. Cleaning: Broccoli and cauliflower have tightly packed florets. Insects, worms or bugs may be hiding in the florets. 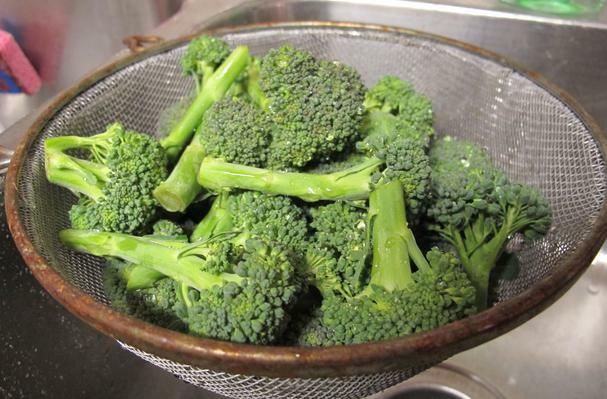 To get rid of them, cut the broccoli or cauliflower into small florets and soak them in salt water. Rinse them in clean water before cooking. Broccoli is hailed as a wonder vegetable. It is packed full of phytonutrients that boost your body's immune power. It has been found in numerous studies to prevent cancer, cleanse and detoxify cells, prevent heart disease and cataracts, build up the density of bones and strengthen the immune system. But how do you keep broccoli fresh? Simple. Follow these simple tricks to keep this healthy vegetable at its peak. To keep broccoli at its freshest stage, store it for 3 to 5 days in a plastic bag in the refrigerator. Cooked broccoli does not store well, as it will break apart when reheated. If you want to store cooked broccoli, steam it until it is just tender and store in a plastic bag for 2 to 3 days. Three other areas of health benefits are important to mention when considering broccoli and its unique combination of nutrients. The first area is eye health. Two carotenoids found in significant concentrations in broccoliâ"lutein and zeaxanthinâ"play an especially important role in the health of the eye. In fact, no tissue in the body is more concentrated with lutein than the area in the outer portion of the retina (called the peripheral retina). Similarly, in the macula near the central portion of the retina, zeaxanthin is uniquely concentrated. Risk of problems involving the macula of the eye (for example, macular degeneration) and problems involving the lens area of the eye (for example, cataracts) have both been show to lessen with intake of foods (including broccoli) that provide significant amounts of the lutein and zeaxanthin carotenonids. A second area is skin support, including support of sun-damaged skin. Here it is the glucoraphanin found in broccoliâ"converted into sulforaphane by the bodyâ"that has received the most research attention. Since skin cells can carry out the process of detoxification, it may be detox-related benefits of sulforaphane that are especially important in helping to counteract sun damage. A third area of increasing research interest involves the metabolism of vitamin D. Broccoli is not a source of this vitamin, but it is an unusually good source of vitamin K and also of vitamin A (in one of its precursor forms, beta-carotene). Many individuals have large vitamin D deficiencies that cannot be remedied through diet alone, and these deficiencies require sizable amounts of vitamin D to be provided through dietary supplementation. When large supplemental doses of vitamin D are needed to offset deficiency, ample supplies of vitamin K and vitamin A appear to help keep our vitamin D metabolism in the proper balance. Assuring adequate intake of vitamins K and A alongside of vitamin D supplementation may turn out to be important in achieving optimal vitamin D supplementation results and avoiding potential problems related to supplementation. Broccoli may turn out to play a particularly helpful role in balancing this set of events by providing its unusually strong combination of both vitamin A and vitamin K.
History: Broccoli evolved from a wild cabbage plant on the continent of Europe. Indications point to the vegetable's being known 2,000 years ago. Since the Roman Empire, broccoli has been considered a uniquely valuable food among Italians. Broccoli was first introduced to the United States by these immigrants, but did not become widely known until the 1920s. If you want to buy a car, you would have to get the mortgage loans. Moreover, my father usually takes a short term loan, which is the most useful. Broccoli health benefits seem to be never ending. This versatile veggie is loaded with down home goodness and super nutrition.